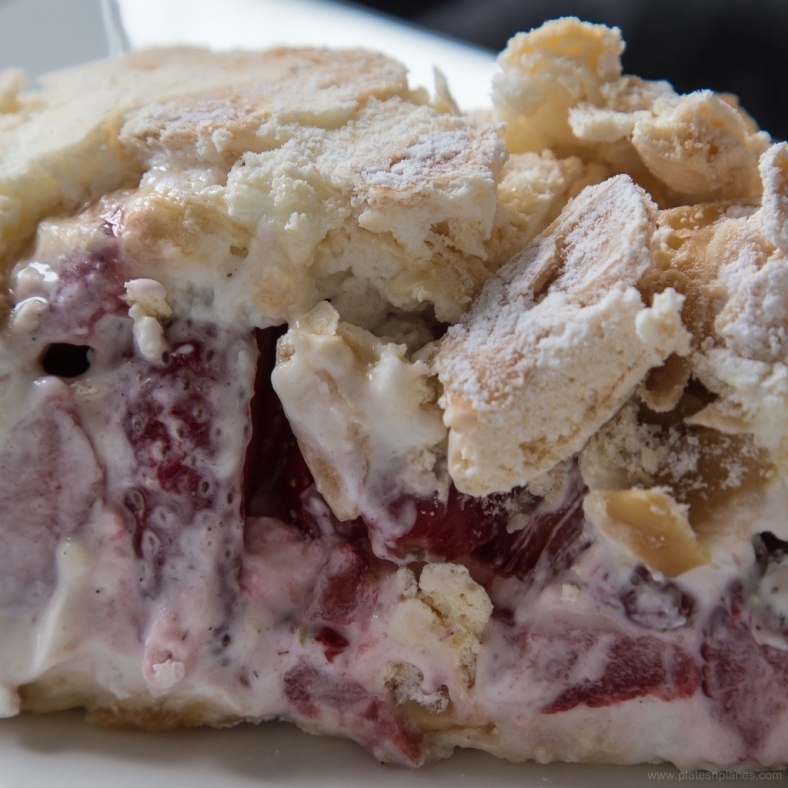 Meringue and toasted almonds are perfect match with delicate sweet strawberry taste. Despite of whipped cream, fresh strawberries keep this cake light. Roll is crunchy and melts in the same time, you’ll be delighted once you try it. After I’ve made several different types of strawberry cakes and few variations with meringue, finally I stuck with Ana Ugarkovic’s version. Thank you Ana for this marvelous recipe and for your superb dessert making skills! 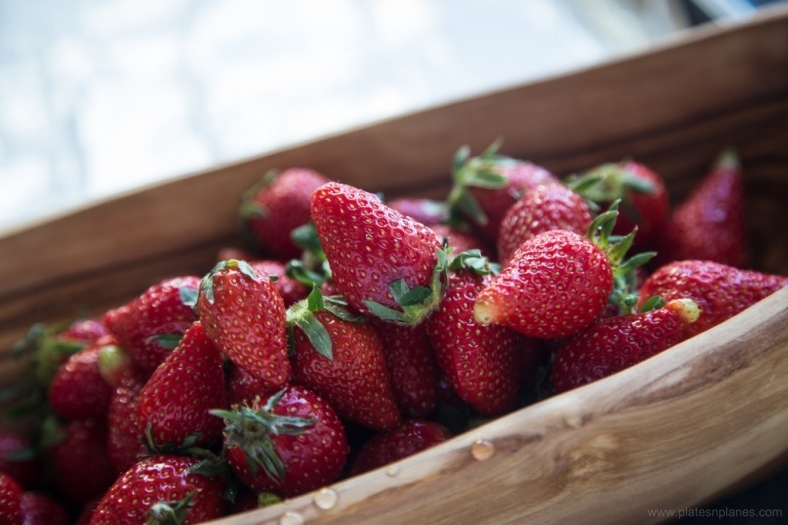 Make it with wild strawberries and cake will be even better. In winter time I am doing it with cherries from compote. This heavenly cake is always “Gran final” for a dinner party. Once when it is served on plates, disappears in a minute. Just bite it and let your tongue linger in this delicious cake. Cover the bottom of pan with baking paper and sprinkle it completely with powder sugar. 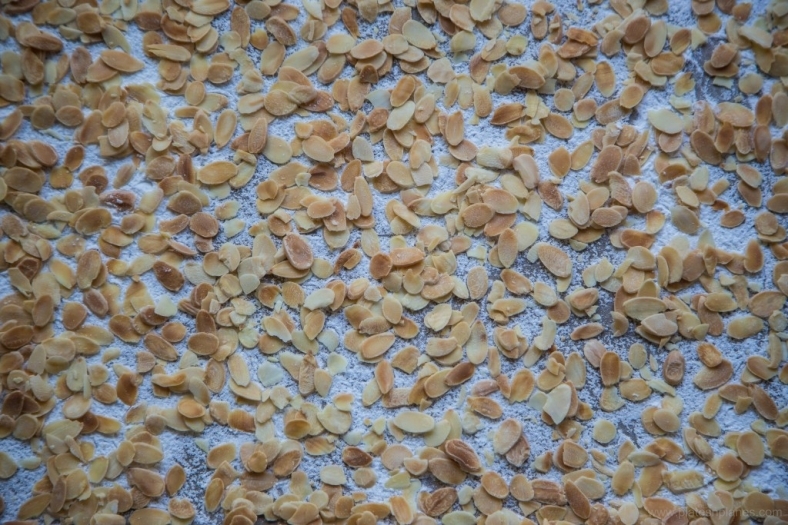 Than spread onto it toasted, sliced almonds.Try do spread them in one layer. Whisk the egg whites and sugar until thick and stiff peaks start to form. Than carefully spread egg whites foam on top of almonds.You can easily spread it with a knife. Bake it in preheated oven on 150C, approximately 25 – 30 minutes.The surface should be light brown and the center still soft. Leave it to cool down completely. In meantime, whip heavy cream with the mixer. In the end sprinkle vanilla sugar into the cream and continue whipping until it’s thick and creamy. Finally spread whipped cream on the top of meringue, then put strawberries in the center. Carefully roll the meringue, the first from one side (longer) then from other,using the baking paper to support it. HINT: This cake should be refrigerated before serving. Slice the cake using a thin-bladed knife. Serve it with a glass of Prosek ( Dalmatian dessert wine).